On Main Street, convenient to historic downtown and nearby attractions. We are located in the heart of Woodland, CA. Walking distance to charming historic downtown Woodland where you’ll find many “Mom & Pop” restaurants, bars and shops. 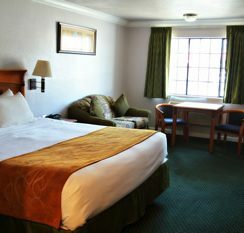 The Journey Inn Woodland offers a convenient and comfortable retreat to both the weary leisure traveler and the busy corporate client. Located just off of Interstate 5, the University of California at Davis is just a short drive away. Whether traveling on business or leisure you will find a friendly and accommodating atmosphere at the Best Western Shadow Inn. Discounts: AAA, AARP, Corporate, Government. Dining / Entertainment: Located near Woodland’s Historic Main Street, entertainment and downtown activities; 13 minute drive from Sacramento International Airport.